Barclays can’t afford to wait around for a new chief executive. Normally, companies that lose their way find a new boss before forging a new strategic direction. Yet the UK bank, which has come horribly unstuck following attempts to manipulate Libor, is doing both at the same time. The scandal has already claimed Chairman Marcus Agius, CEO Bob Diamond and Chief Operating Officer Jerry del Missier. Rather than wait some six months for their replacements, the remaining top brass – Barclays Capital CEO Rich Ricci and the head of retail operations at Barclays, Antony Jenkins – are leading a major internal review, according to a person familiar with the situation. This probe, separate from the bank’s investigation into the London Interbank Offered Rate affair likely to be conducted by ex-Freshfields lawyer Anthony Salz, will be a root-and-branch one. It is expected by insiders to take at least three months. Ricci and Jenkins will carve each BarCap business segment into three categories: ones hitting return targets, those clearly not or that have reputational baggage, and those somewhere in between. The result may not be as savage as what happened at Royal Bank of Scotland in January. That review led to the investment bank’s assets being cut by a third. BarCap’s core strengths in fixed income, currencies and commodities along with its U.S. and European investment banking operations look more secure, say, than less proven areas like equities or its Latin American and Asian businesses. The real significance is that the audit is being conducted at all. Diamond’s perpetual bullishness meant that as rivals were shrinking between December and March, BarCap’s risk-weighted assets grew, driven partly by technical regulatory reasons but also by a conviction that the industry slowdown would be cyclical, not structural. Without its swashbuckling leader, what’s left of the executive board at Barclays seems more inclined to join the industry consensus. Cuts appear inevitable. Whether or not Barclays goes whole hog and sheds investment banking entirely will remain an issue for whoever steps in for Diamond and Agius. But BarCap is already shifting direction by getting smaller instead of bigger. That new trajectory may be the one for new leadership to follow. 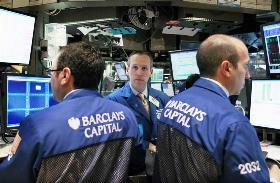 Traders work at the Barclays Capital kiosk on the floor of the New York Stock Exchange. Barclays could find its investment banking arm more costly to run under proposals unveiled last week to make the UK banking system safer. Barclays is undertaking a review of all parts of its investment bank Barclays Capital following the departure of Chief Executive Bob Diamond, according to a person familiar with the situation. The question of whether or not to rid itself of BarCap entirely will not be addressed in the current review as it remains a strategic question for the board, the person said, but the board will periodically review the investment bank’s role at Barclays. Rich Ricci, the chief executive of BarCap, has told colleagues he does not wish to be considered for the vacant post of CEO at Barclays, the Sunday Telegraph reported on July 21.